Historic windows hold a wealth of memories made throughout the years. Nevertheless, preserving them may mean compromising your home’s energy efficiency and protection from elements. You can keep the traditional appeal of your home through our window replacement services. We underst and that your windows in St. Louis should reflect the period, style, and the regional characteristics of your home. If you aim to retain as much of the character of the historic windows as possible, we will provide the best replacement unit. Some window types, like the bow or bay windows, can give your home a nostalgic feel. These types extend out of the wall and feature huge panels. They appear majestic from the outside and create a pleasant, old-timey ambiance inside the home. 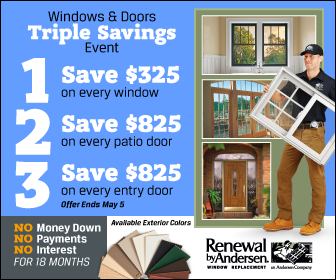 Renewal by Andersen of St. Louis can help you weigh your options. We will be glad to present you with the window types that will blend well with your historic home. As the number one source of windows and doors in St. Louis, we can help you find the one that will match your preferences. We offer classic, vintage-looking windows that perform like modern units. In addition, our Fibrex® frame composite will not rot, chip, crack, warp, or peel. The perfect combination of Fibrex and our High-Performance™ Low-E4® glass provides an incredibly efficient, durable, and maintenance-free window. Call us today at (314) 332-2364 and we’ll be glad to assist you. You can also request for a free estimate.